I recently had the pleasure of attending the awards ceremony for this year’s Intel Science Talent Search . Before the award announcements , I enjoyed visiting the posters of many of the 40 finalists. These high school students displayed impressive knowledge and passion for their projects, many of which were quite sophisticated. A number of the finalists were even savvy enough to test my understanding so they could pitch their presentation to me at an appropriate level. A highlight of the evening was definitely the award presentations themselves. The winners were clearly thrilled to be recognized among an incredibly accomplished group of young scientists. The speakers—who included Elizabeth Marincola , president of the Society for Science & the Public, which runs the Science Talent Search program; Paul Otellini , president and CEO of Intel; Miles O’Brien , who covers science on the PBS NewsHour; and one of the students, selected by his peers—uniformly stressed the importance of communicating the excitement and value of science to the public. This is a good reminder to all of us in the scientific community about our responsibility to reach out broadly to explain what we do and why we do it in understandable terms that can inform the public and potentially inspire new members of future generations of scientists. As co-chair of the search committee for a new NIGMS Director, I want to tell you about the committee and ask for your help in identifying candidates for this critical position. Not surprisingly, we’re looking for an exceptional leader with strategic vision and a distinguished record of research and management achievements. NIH Director Francis Collins met with us last week and emphasized the need to find an outstanding person who can speak compellingly about the importance of basic research, can direct the Institute’s efforts to support exciting research across a broad range of disciplines and is committed to fulfilling the Institute’s mission of training the next generation of scientists. For more about the job qualifications, how to apply and other details, see the official vacancy announcement at http://www.jobs.nih.gov/vacancies/executive/nigmsdirector.htm. The application receipt deadline is April 29, 2011. UPDATE: The application receipt deadline has been extended to May 13, 2011. We’re looking for a program director (also known as a “health scientist administrator/program officer”) to oversee research grants and other activities related to mechanistic aspects of one or more of the following areas: DNA replication, recombination, mutagenesis and repair; gene expression; protein synthesis; or related cellular processes. Candidates should have expertise in state-of-the-art genetics, molecular biology and/or genomics. The position is in the Genetic Mechanisms Branch of our Division of Genetics and Developmental Biology. Please see the NIH HSA Web site for position requirements and detailed application procedures. Note that this is a global recruitment for program officer positions throughout NIH. To be considered for the genetic mechanisms position in NIGMS, be sure to emphasize aspects of your training, expertise and research interests that make it clear that you’re a good fit for what we’re looking for, as described above. If you’re interested, act quickly, as this vacancy announcement closes on March 14, 2011. Not looking for a position right now? Please help us out by forwarding this information to others who might be interested. We’re advertising for a scientific review officer to oversee the peer review of applications for a broad range of research and training programs, including programs aimed at increasing the diversity of the scientific workforce. We particularly seek someone with expertise in biochemistry, biophysics, computational biology and bioinformatics, and/or pharmacology to join our busy and interactive scientific review team, but the job involves setting up and managing review groups across the entire range of biomedical, clinical and behavioral fields we support. For details on the position and application process, see the NIH HSA Web site. The vacancy announcement closes on March 14, 2011. The highest priority tools and resources needed to move forward. We hope you’ll take the time to weigh in with your opinions and specific examples between now and the March 18 response deadline. Let me know if you would like to learn more about trans-NIH activities in this area, as I’m a member of the group that issued this RFI—the Single Cell Analysis Working Group of the NIH Common Fund (formerly known as the NIH Roadmap), which provides strategic planning, coordination and support for programs that cut across NIH institutes and centers. I have previously noted that NIH has proposed creating a new entity, the National Center for Advancing Translational Sciences (NCATS), to house a number of existing programs relating to the discipline of translational science and the development of novel therapeutics. 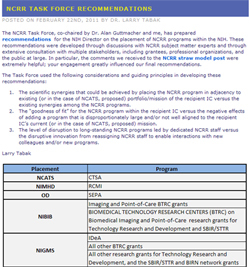 Plans for NCATS have been coupled to a proposal to dismantle the National Center for Research Resources (NCRR), in part because the largest program within NCRR, the Clinical and Translational Science Awards, would be transferred to NCATS and in part because of a statutory limitation on the number of institutes and centers at NIH. NIH leadership established a task force to determine the placement of NCRR programs within NIH. This group initially developed a “straw model” for discussion and more recently submitted its recommendations to the NIH Director. The recommendations include transferring the Institutional Development Award (IDeA) program and some Biomedical Technology Research Centers and other technology research and development grants to NIGMS at the beginning of Fiscal Year 2012. As you may be aware, I have expressed concerns about the processes associated with the proposal to abolish NCRR. I hope it is clear that my concerns relate to the processes and not to the NCRR programs, which I hold in very high regard. This opinion is also clearly shared by many others in the scientific community, based on comments on the Feedback NIH site and in other venues. While there are several additional steps that would need to occur before organizational changes could take place, we at NIGMS are already deepening our understanding of the NCRR programs through meetings with NCRR staff and others directly familiar with the programs. We welcome your input, as well, particularly if you have experience with these NCRR programs. Please comment here or contact me directly. One of the key principles of the NIH Enhancing Peer Review efforts was a commitment to a continuous review of peer review. In that spirit, NIH conducted a broad survey of grant applicants, reviewers, advisory council members and NIH program and review officers to examine the perceived value of many of the changes that were made. The results of this survey are now available. The report analyzes responses from these groups on topics including the nine-point scoring scale, criterion scores, consistency, bulleted critiques, enhanced review criteria and the clustering of new investigator and clinical research applications. NIH Enhancing Peer Review Survey criterion score responses from applicants. Please feel free to comment here or on Rock Talk, where NIH Deputy Director for Extramural Research Sally Rockey recently mentioned the release of this survey.